Jack Kirby was as much of a hero to the comic book industry as the characters he created. An innovator in the industry for his in-your-face artistic style of exaggerated action and his dynamic two-page spreads, Kirby is credited with renowned for co-creating iconic figures like the Hulk, the X-Men, Iron Man, the Fantastic Four and Captain America. 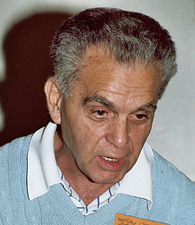 Jack Kirby was born Jacob Kurtzberg on August 28, 1917. He grew up in a rough neighborhood on Manhattan’s Lower East Side; his experiences would later be reflected in his comic book art. Kirby’s artistic ability was evident from an early age in his doodles and sketches. He enrolled in the Pratt Institute in Brooklyn at age 14, but dropped out after a week because he felt he didn’t fit in. Instead, he cultivated his talents on his own, following the example of comic artists Alex Raymond and Milt Caniff. In 1935, Kirby began working as an artist for Max Fleisher Studios, drawing for the “Popeye” cartoon series. A year later, he scored a job as a comic book artist for the Lincoln Newspaper Syndicate. Eventually Kirby teamed up with Joe Simon at Timely (later, Marvel) Comics, and together they developed the character of Captain America. Their 10-issue collaboration on “Captain America” saw record sales. Kirby then went to work for rival DC Comics, but was only there a year before he was drafted into World War II as an infantryman. After the war, Kirby illustrated dozens of different comics in various genres, including horror, romance, Western and crime. In the 1950s, comic book censorship took a toll on the industry, and finished the Kirby/Simon partnership. After bouncing around among numerous companies, Kirby landed at Atlas (again, a prior name for Marvel) Comics in 1959, where he developed the idea for the Fantastic Four superheroes. Marvel Comics editor and head writer Stan Lee recruited Jack Kirby into a new way of creating comics. Rather than having a full script that the artist would then illustrate, the writer and illustrator began with an idea they agreed upon, penciled first and then scripted. Kirby and Lee established some of America’s most recognizable superheroes. Throughout his career, Kirby either created or co-created hundreds of characters, including Thor, the Hulk, Iron Man, the X-Men, the Silver Surfer and the Fantastic Four. Kirby also put himself into his heroes; both the Thing and the Hulk appear to be semi-autobiographical: ugly, physically strong characters “redeemed” by the love of a woman. After helping to helm a “golden age” for the comic book industry, Kirby left Marvel shortly after it was sold in 1970. The new owners of the company saw Stan Lee as the sole creative force behind its success and overlooked Kirby’s accomplishments and creativity. Kirby moved to DC comics, but received nearly the same treatment. He worked a number of other jobs doing artwork for comic books and cartoons over the years but his work never received the acclaim that it did while he was at Marvel. He eventually returned to Marvel, and then went on to provide character design for such animated TV series as “Thundarr the Barbarian. Kirby died on February 6, 1994. His art, creativity and contribution to comic books continue to inspire films, TV series and new generations of comic book artists. This article was originally written by John Noonan; it was updated August 25, 2017.